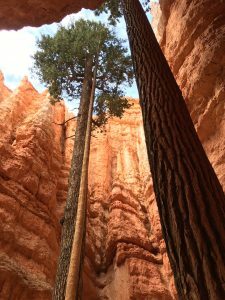 Known colloquially as the most beautiful 3-mile hike in the world, the Navajo/Queens Garden Loop is the go-to hike for people who are only passing through Bryce for the day as part of a longer road trip through the American southwest. 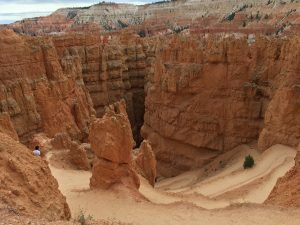 Ideally, you’ll have set aside enough time to do all the amazing hiking available in this stretch of south central Utah. We learned that timing matters. There’s a slight difference here between “summer” and off-season months. This last time we visited was in October, the beginning of the off-season. 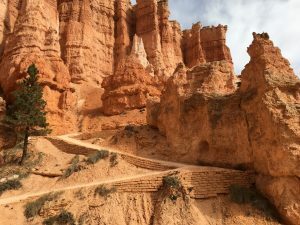 Thus, we were allowed to hike this loop counter-clockwise and by starting the descent down the steep, if breath-taking, set of switchbacks known as “Wall Street.” We greatly preferred this way, which is not an option in the summer during which the trail is shared with horses and mules. The backside of this loop was still steep but not nearly as bad. With a short half-mile connection between Sunrise and Sunset Point, you’ll also have two different fairly large parking lots to aim for as landing spots. Try one. If you can’t find a spot there, head over to the other point.